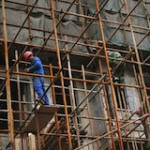 As per NYC Local Law 52 of 2005, to continue to install or remove Supported Scaffolds in New York City, an individual must successfully complete this 8-Hour Supported Scaffold Installer/Remover Refresher training course four years following the completion of the 32-hour Supported Scaffold Installer and Remover Course and every four years thereafter. Upon successful completion of the course, participants will receive an 8-Hour Supported Scaffold Installer/Remover course completion picture ID card that will be valid for 4 years. Please Note: Students attending this course must present a 32-Hour Supported Scaffold Installer/Remover ID card from an approved training provider. Below are the most recent student reviews for previous 8-Hour Supported Scaffold Installer/Remover Refresher Courses. I enjoyed attending the 8-Hour Supported Scaffold Installer/Remover Refresher class very much. The instructor Osman at TSC... I enjoyed attending the 8-Hour Supported Scaffold Installer/Remover Refresher class very much. The instructor Osman at TSC Training Academy was very knowledgeable and he made the class very interesting. All of us students were pleased with the instructors teaching and he kept us focused to his lecturing during the whole duration of class. Facilities at TSC Training Academy are very nice and clean. I did many classes with them and I will come back again. I always recommend this Academy to all of my friends.